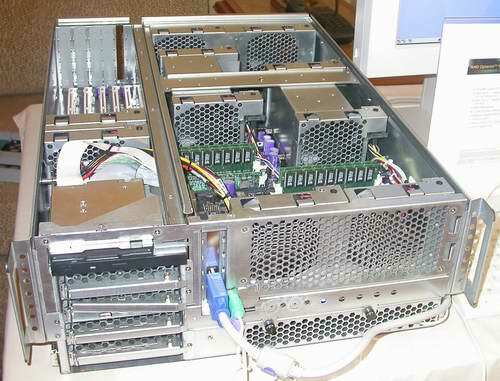 AMD has shown off their 4-way Opteron server numerous times, in this case we have the same system we've seen before but we've never brought up-close-and-personal pictures of it so here you go. The two metal enclosures you see in the overhead shot are the cooling bays for the four Opteron processors, most likely running at 1.4GHz. We asked AMD if we could expect to see the same clock speed targets (read: ~2GHz) for the Opteron's launch on April 22nd as we were told to expect for the Athlon 64, but we were given the response that the Opteron user base is not as sensitive to clock speeds as the Athlon 64 user base is. In short, AMD doesn't have to launch the Opteron at ~2GHz targets if they don't want to; in our opinion, AMD would if they could, so only time will tell what we see on April 22nd. AMD told us that there will be three Opteron speeds on April 22nd, two of which will be immediately available with one following a month or so later; they also insisted that they will have the fastest 32-bit server CPU upon their launch. Each one of the four Opteron CPUs has their own dedicated memory controller, and this particular board design calls for each CPU to have 4 total DIMM slots; remember that the Opteron has a dual channel DDR memory controller, so memory must be installed in pairs as you can see above. 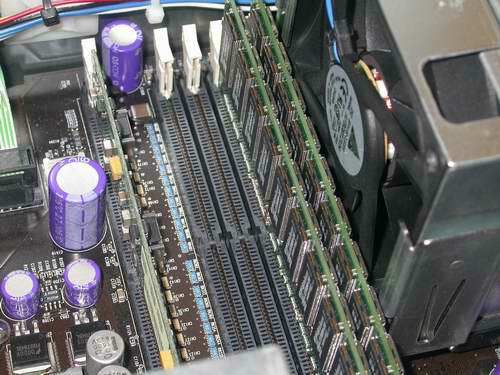 The slot towards the left of the picture above isn't for a fifth DIMM, but rather the voltage regulator circuitry for the set of memory slots. AMD wanted to save space on the reference board, which is why they placed the VRM circuitry for the memory banks on these risers instead of on the board itself - by no means is it anything that should be commonplace to all Opteron boards, it's just what AMD decided to do in this case. 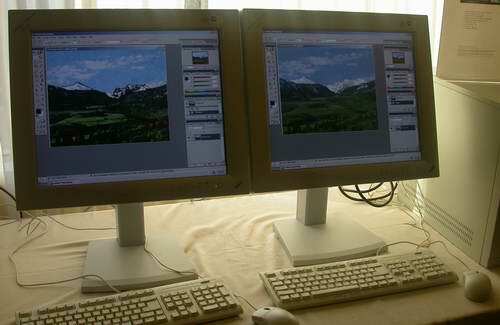 The demo was using Intel's Hyper-Threading Photoshop script, apparently from Intel's website, and showed the Athlon XP 3000+ outperforming the Pentium 4 3.06. As you will remember from our review of the Athlon XP 3000+, there are definitely situations where it can outperform the 3.06GHz Pentium 4 - but at the same time, there are even more situations where the Pentium 4 can outperform it.